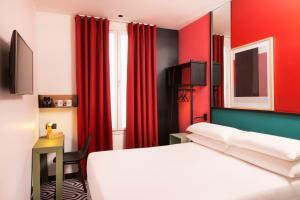 Located just a 5-minute walk from The Moulin Rouge, this hotel offers en suite rooms with free WiFi. The Montmartre district is a 15-minute walk away. 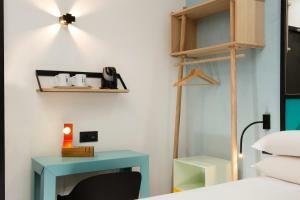 Featuring satellite TV, a telephone and a minibar, rooms at Hotel Pilime are simply furnished. All rooms are serviced by an elevator. Breakfast is served daily at the Hotel Pilime in the hotel’s breakfast room with an arced stone ceiling. Breakfast can also be served in guests’ rooms upon request. The reception desk is open 24 hours a day at the Hotel Pilime and offers advice on tourist attractions in the area. 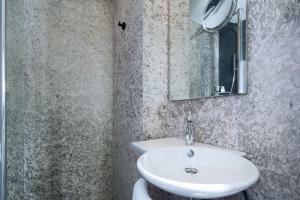 Luggage storage and a safety deposit box are also available. Place de Clichy Metro Station is located 120 metres from the hotel and offers direct access to The Arc de Triomphe and The Champs-Elysées. Galleries Lafayette is a 20-minute walk away. A shuttle service from the hotel to the airport can be arranged at an extra cost. 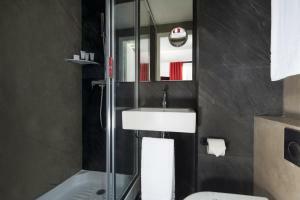 These simply furnished rooms provide satellite TV and a minibar. 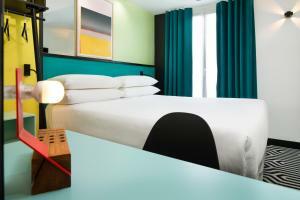 Rate: € 73.80 ... € 265.00; select dates below to get current rates. 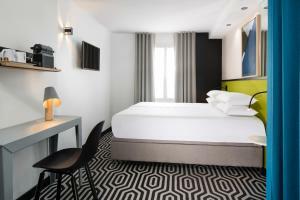 Rate: € 115.70 ... € 118.39; select dates below to get current rates.